Another early start and a very misty morning drive into the Entre-Deux-Mers to be at the bottling of the second half of little Bordeaux Château Geneau. The mist is now here every morning as the cold nights set in and the warm Dordogne releases the mist like a smoke machine! This Geneau is really lovely drinking claret; just what affordable Bordeaux used to be like. It’s a wine we have nurtured from the beginning and I can truly recommend it. Once all was good I left to meet JMS at Le Chai and we did a tasting run through the 2011’s in the Chai. Viognier coming real good now and standing out today, think we’ll make a pure one this year. Not much of it so keep an eye on my blog for further info! Today we were going 3hours south of Bordeaux to the department of the Gers to meet up with our friend Lionel Osmin. 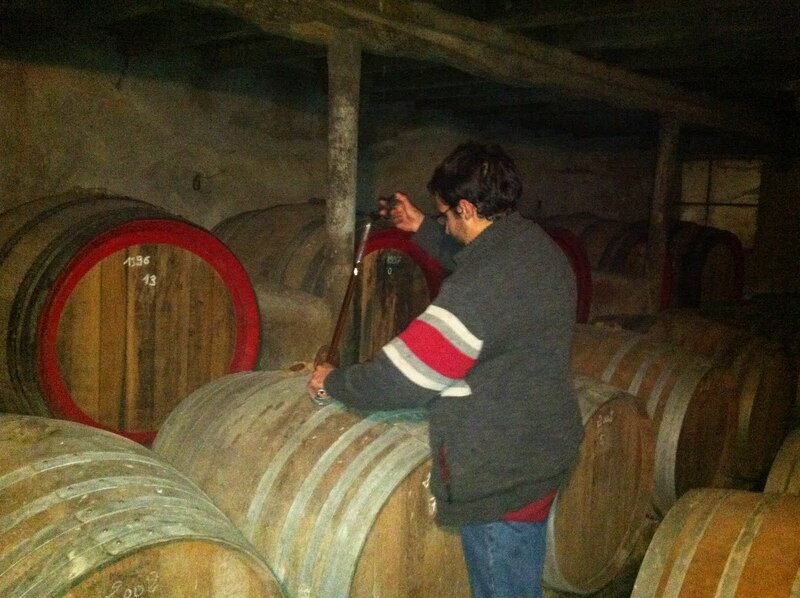 We’re tasting the red vats and checking the grapes for the famous moelleux wines of Gascony that are still hanging on the vine! We made our way down through the vineyards of Côtes du Marmadais, the pine forests of the Val de Garonne-Gascogne, through the rolling hills of Armagnac and finally our destination: Viella in the tiny Appellation of Madiran. We were in real deep country now where cows for beef, geese and ducks for foie gras and black pigs share the land with the vineyards. The Gers is renowned for its amazing cuisine and the produce here is just as spectacular as the landscape. We met up with our friend Lionel Osmin who’s born and bred in Gascogny. After studying winemaking in Toulouse he decided to return to his home region to concentrate on making, promoting and selling these rare wines. If anyone knows anyone here then its Lionel! 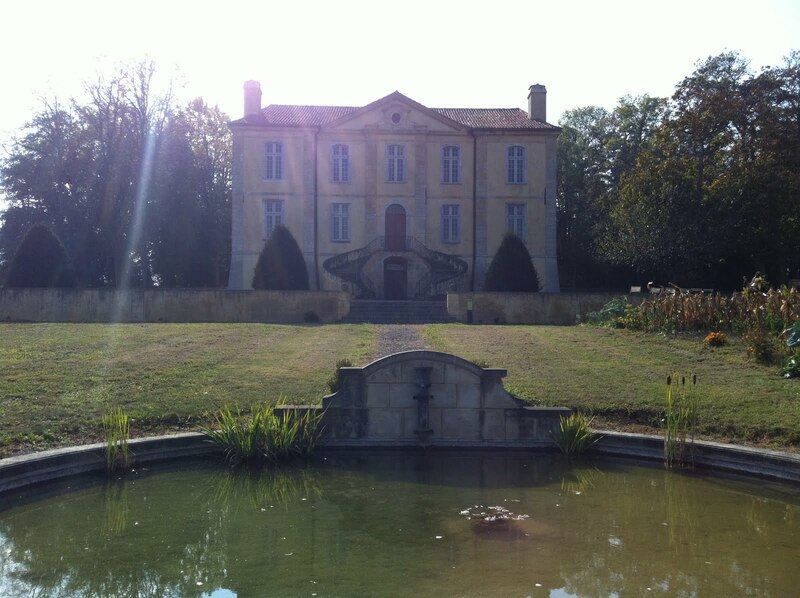 The people here are hardened farmers and our first stop was at Monsieur Bortolussi’s magnificent Château Viella. 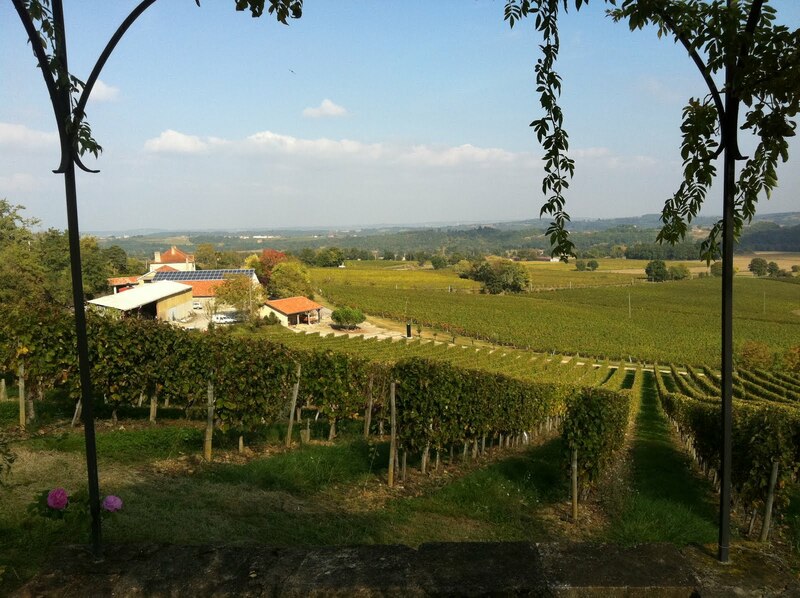 We started with a grand tour of the vineyards of both the red Madiran appellation and the whites of Pacherenc du Bilh. The king of the red grapes here is Tannat; a hardy grape with thick skins to protect it from the regular rainfall. Thick skins give an abundance of tannin requiring careful vinification techniques to avoid tannins leaching into the wine. Very different methods are used here in Madiran compared to Bordeaux, but when it’s done well the result is the darkest silkiest wine ever! 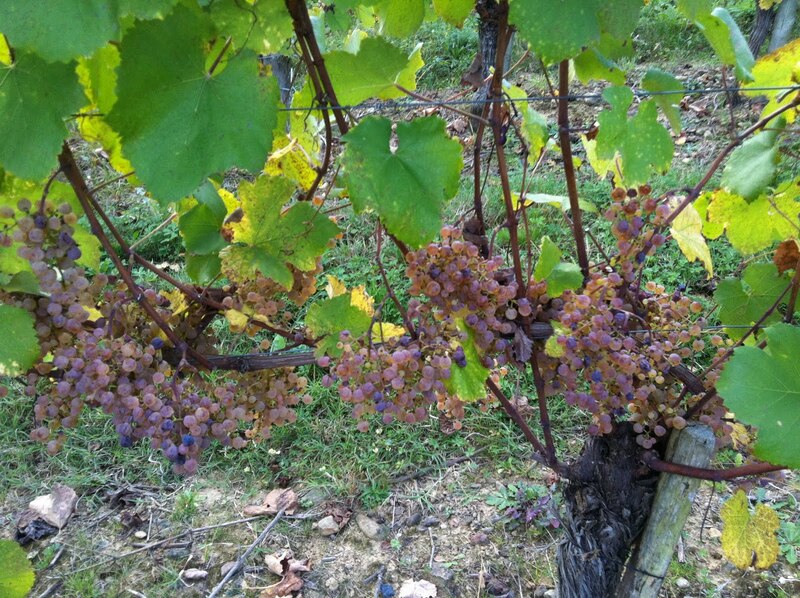 The Tannat has already been harvested but the tiny Petit Manseng white grapes still hang on the vine. This rare grape makes the semi sweet wines of appellation Pacherenc du Bilh. The name of the game here is to keep the botrytis at bay and the thick skinned tiny berries are perfectly adapted to do so as they hang in loose bunches allowing aeration around every berry. Biting into one of the berries is quite an experience as you chew through the skin the front of the tongue is hit first by an incredible sweetness followed by the most searing acidity! These wines can age for a very long time and if you can get a bottle try it, a marvellous wine! 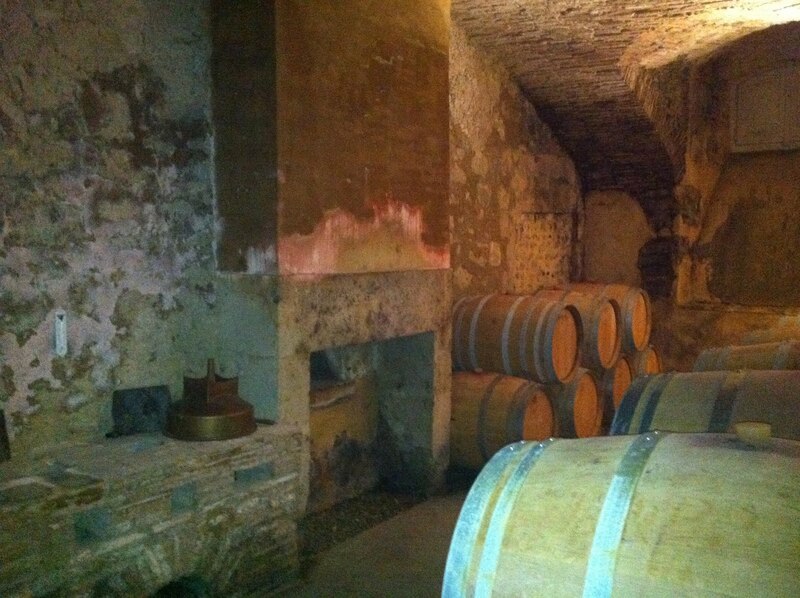 We finally made it to the château high on the hill and entered into the barrel store at the bottom of the huge house. The barrels sit in the great kitchen that once served the entire household. As you stand there you can imagine a once-bustling kitchen of cooks, fires and servants rushing about. However, it’s very calm in here now! After talking, we learnt that they also distil traditional grapes of Bacho and Ugni Blanc to make their own Armagnac! We couldn’t resist asking to have a taste and a big old door was drawn aside revealing an old underground cellar full of barrels of Armagnac going back 20 years. As we entered the cellar we were nearly knocked off our feet by bats flying around in there! The son drew some 1993 55% vol pure Bacho from a barrel and its golden colour and almond aroma was absolutely superb. Tasting Armagnac amongst flying bats was certainly a first for me! 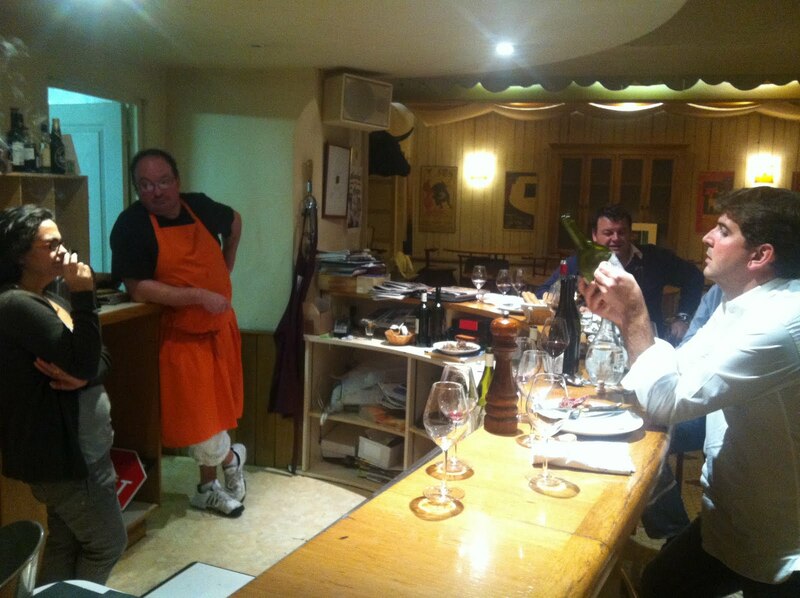 A long day was rewarded by Lionel (and his knowledge of the people and the region) with a meal at the reputed Bernard Daubin restaurant in the tiny village of Montreal de Gers. It opened exclusively for us by the highly rated and well known French chef Bernard Daubin himself … and what an experience it was to be! I am extremely fortunate to have been there and a grand merci to Lionel, Bernard and Veronique, quell experience!! Please visit this restaurant if you are in the area it is truly an incredible experience! Then off to London for the Laithwaites show at the Arch in Borough Market; maybe I saw you there! The Week That Was ... Rather Busy!